Karen Armstrong’s The Great Transformation (2007) suggests that compassion became a dominant theme in human experience for the first time between 800 to 200 BCE, called the Axial Age by German philosopher Karl Jaspers. Armstrong notes that over this 600-year period a religious revolution occurred in four different regions of the world: Hinduism, Buddhism, and Jainism on the Indian sub-continent; Confucianism and Taoism in China; monotheism in the Middle East; and philosophical rationalism in Greece. In each case we discover ancient traditions calling followers to compassionate, ethical behavior. This near universal spiritual agreement suggests we are hard-wired to be empathic and compassionate, that we are meant to involve ourselves in kind and caring work. To be sure, we are not locked into compassionate behavior – but worth noting is that an alternative has emerged. We still have the capacity and sometime inclination to strike out verbally or physically, to injure and to kill. This capacity to do harm has probably been with us since the inception of our race. Karen Armstrong makes the case, though, that at a certain point in history, humans started taking notice of and promoting our capacity to do good for others. The wisest amongst us, in vastly different settings, proposed an ethic of care for all, starting with the vulnerable, called for generosity to strangers and even martyrdom for the sake of others. To understand what a radical development this was, imagine a world where no one championed goodness, where compassion was considered weakness and vengeance a duty. An injunction to care for others became infused in various holy scriptures starting nearly 3000 years ago, each tradition identifying compassion as a religious and cultural duty in its own unique way. The Golden Rule, showing up in so many traditions, exemplifies this call for compassion. But most religions go far beyond the Golden Rule, detailing instructions for charity and service. Considering how much attention religious conflict receives every day, it is refreshing to discover this common ground; one can only thank Professor Armstrong for recently launching the Charter of Compassion globally. For local interfaith activists, however, it is worth noting the interfaith service projects have had no trouble in joining healing, caring hands around the world. Chaplains in hospitals, the military, and universities offer pastoral care to adherents of different faiths. Here in North America it is difficult to find a town, city, or metropolis where different faith communities are not already working together to address human needs. Fresh produce ready for distribution at the Quincey Pantry. The following examples are examples of hundreds of similar programs today. The mission of Interfaith Social Services in Quincey, Massachusetts, is to “strengthen family life and offer assistance to anyone in need.” To that end, ISS distributes over 400,000 lbs. of food to impoverished local residents every year, provides assistance and homelessness prevention services, organizes backyard gardeners to produce food for distribution, offers counseling services to adults, children, couples, families, and hospital patients, and provides affordable clothing and household items as well as outfitting low income job seekers with free professional attire. InterAct Cleveland builds relationships and understanding across diverse religious traditions. It is a nonprofit coalition of more than sixty Baha’i’, Christian, Hindu, Islamic, Jewish, Sikh, and Unitarian Universalist congregations, faith communities, campus groups, and community organizations. 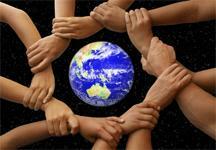 Projects are undertaken when two or more groups come together to make the community a better place. This happens primarily around community meal programs, “Homeless Stand Down” events, and interfaith education for teens. New friends gather in a home for an Interfaith Dinner Dialogue. In the York Region north of Toronto, the goal at Mosaic Interfaith Out of the Cold Program is “To provide shelter and food to the homeless and poor through a network of interfaith community partners under the principle of compassion, acceptance and safe refuge.” Six congregations representing Catholic, Jewish, Muslim, and Protestant congregations provide overnight shelters four nights per week in the coldest months of the year. Fifty men and women a night are accommodated. In your neighborhood or one nearby you’re likely to find interfaith bridges being built among people animated by the ancient Axial insight that compassion is our most important value. Interfaith dialogue these days comes in dozens of guises, all of which help create a kinder, more compassionate world. But those who join hands across religious differences to go the route of service, caring for the disinherited, for outsiders, the sick, and the poor, the hungry and the imprisoned, these folks are on the frontlines of a healthy, vital interfaith culture. They give life and energy to our shared conviction that the world needs healing and that every person deserves respect and opportunity. In Christian theology charity, or love (agapē), is the greatest of the three theological virtues: “God is love.” Love, in the sense of an unlimited loving-kindness towards all others, is referred to as universal love and held by some to be the ultimate perfection of the human spirit, because it is said to both glorify and reflect the nature of God. Confucius developed a system of ethics and politics that stressed five virtues: charity, justice, propriety, wisdom, and loyalty. His teachings were recorded by his followers in a book called Analects, which formed the code of ethics called Confucianism, the cornerstone of Chinese thought for centuries. Charity, for which the expression used in the Holy Quran is “spending out of what God has given you,” means using your energy, talent, resources, money, possessions, or whatever else, to help and do good to those in need. Charity is one of The Five Pillars of Islam, basic duties for all Muslims. Dāna is generosity or giving. It can be defined as an act of giving something without expecting anything in return. 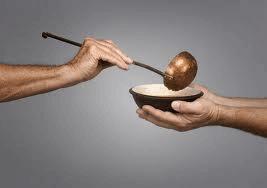 This earns a person spiritual wealth and makes generosity an important value for Jains. Tzedakah literally means righteousness, but it is often interpreted as charity, because Judaism views giving as the ultimate act of righteousness. Whether it is teaching a skill, donating goods, or giving money, tzedakah is an integral part of living a Jewish life and is in fact required of all Jews. Group sharing of knowledge and responsibilities is integral to the Native American lifestyles. Generosity is valued, especially in helping others who are less fortunate. The spiritual God of the Native Americans is positive, benevolent, and encountered in daily living. Sikhism is known for very special concept of Wand Chhakna – giving something out of the bounties bestowed by God for the welfare of needy, less fortunate and deserving people. It is a concept of serving each other without selfish motives and sharing wealth and the knowledge of God with each other.